A celestial inspired pendant with a hand-drawn and etched Moon, Sun & Stars on a copper disk which I cut from sheet metal. 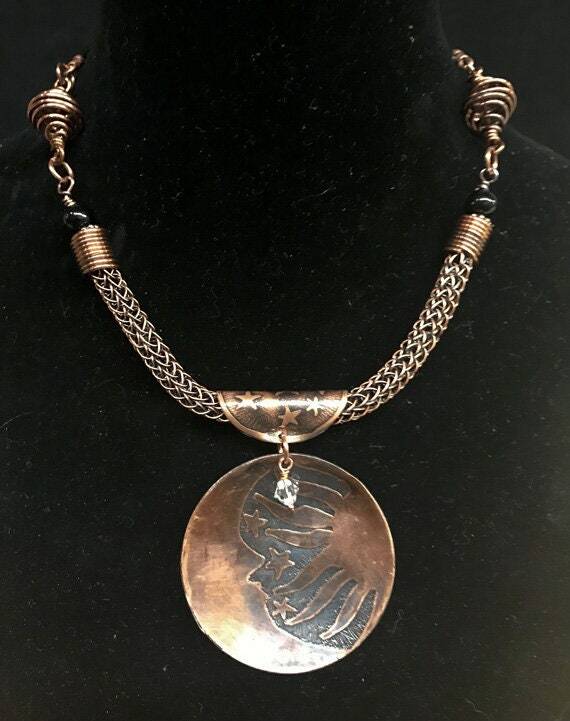 I then added copper viking knit with Goldstone accents, handmade wire beads and Leather. I have embellished the pendant with Swarovski crystal. I then created a bail with etched stars and attached the pendant to this bail. It has been given an oxidized patina and a protective lacquer coating. This necklace is absolutely beautiful; the details, the care in the creation abundantly evident. There will be more Wired Gingersnap jewelry in my future!